An artist's illustration of NASA's Cassini spacecraft flying by Saturn's icy moon Enceladus. Cassini is making its final close flybys of Enceladus in 2015. NASA's Cassini spacecraft has spent a decade studying Saturn and its family of moons. With the mission set to end in 2017, the probe has been busy gathering as much data as possible. But starting today (Oct. 14), Cassini begins to wrap up its time at Saturn's icy moon Enceladus with a series of three close encounters. Cassini's first flyby, which occurred this morning at 6:41 a.m. EDT (3:41 PDT/1041 GMT), bringing the spacecraft within 1,142 miles (1,839 kilometers) of Enceladus. It was expected to provide the first clear look at the moon's north polar region. The summer sun is shining on Enceladus now, illuminating its northern latitudes and allowing scientists the chance to search for signs of ancient geological activity, according to a NASA statement. The feat was not possible during previous encounters as the region was covered in winter's shadow. On Dec. 19, the probe will conduct its final flyby of Enceladus. 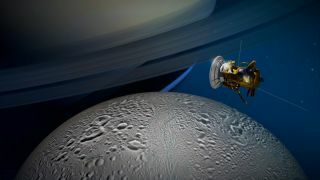 Passing by at a distance of 3,106 miles (4,999 km) above the moon's surface, Cassini will measure how heat flows from the interior to the surface. Data collected will help determine the driving force behind the moon's geysers. "We've been following a trail of clues on Enceladus for 10 years now," Cassini science team member Bonnie Buratti, an and icy moons expert at NASA's Jet Propulsion Laboratory in Pasadena, California, said in the same statement. "The amount of activity on and beneath this moon's surface has been a huge surprise to us. We're still trying to figure out what its history has been, and how it came to be this way." The geysers, along with the presence of a global ocean of water on Enceladus, and evidence of hydrothermal activity — similar to the activity we see on the ocean floor here on Earth — may mean that the Saturn moon is one of the best places in the solar system to search for life beyond our own planet. "The global nature of Enceladus' ocean and the inference that hydrothermal systems might exist at the ocean's base strengthen the case that this small moon of Saturn may have environments similar to those at the bottom of our own ocean," Jonathan Lunine, an interdisciplinary scientist on the Cassini mission at Cornell University in Ithaca, New York, said in the statement. "It is therefore very tempting to imagine that life could exist in such a habitable realm, a billion miles from our home." Scientists plan to learn as much as possible during these flybys as they will be the last chances to see Enceladus up close for many years to come.